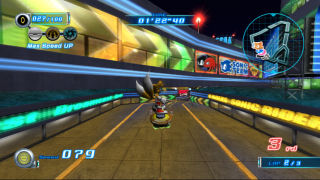 90's Boulevard is an extra level outside the story mode of Sonic Riders: Zero Gravity. This level and its counterpart, 80's Boulevard, only become available after the main plot is completed. The area is, essentially, a 1990's city, with advertisements for SEGA products from that era like the Sega Mega Drive, NiGHTS, and Crazy Taxi, as well as adverts for a wealth of early Sonic games like Sonic the Hedgehog and Sonic Spinball. Neon signs tint the city's nightscape, fodder for a prismatic meteor burst! Despite being a post-story-mode pan-franchise SEGA celebration, the stage is actually given a kind of plot-based rationalisation, in that the black hole conjured by Master Core: ABIS in Astral Babylon wrenches the city from the past into the present. Extreme Gear riders must power along brightly-lit nighttime streets, before racing up the side of a skyscraper and continuing along the roofs, floodlit by buzzing helicopters. This page was last edited on 10 April 2018, at 14:06.